It was with great sadness, and a tremendous sense of unfairness, that I learned of the death of Harry Crews, the Georgia-bred author of The Gospel Singer and A Childhood: The Biography of a Place. The unfairness is somewhat illogical, given Crews’ many years of drinking, fist fights, punishing self-abuse, etc. That Harry Crews should die, even at the age of 76, is not exactly unfair. Nonetheless, we were robbed. Trying to come up with an appropriate response to my grief-struck sullenness, I decided to take a cue from the man himself. Beyond his literary prowess, Crews was in possession of what I consider to be the very best literary tattoo ever penned and pecked into flesh. 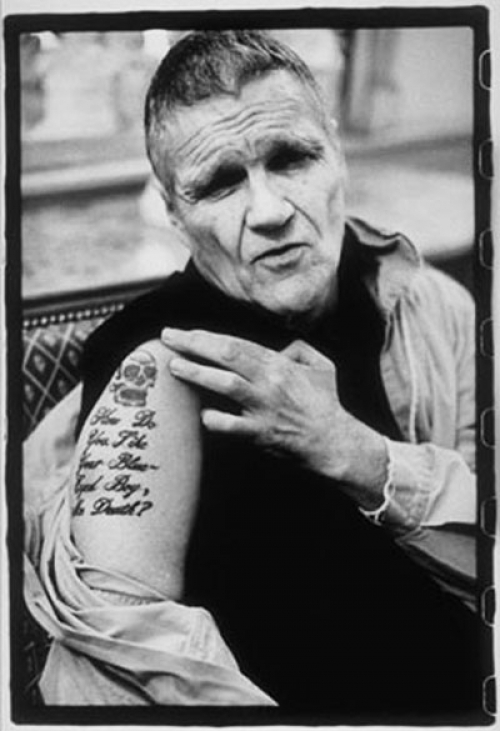 On his right forearm, beneath a looming skull, is the ee cummings line, “How do you like your blueeyed boy, Mr. Death?” What better way to pay homage, I thought, than to riffle up some similarly badass literary quotations that would make killer tats? Below is my selection. Talk into my bullet hole. Tell me I’m fine. It wasn’t even me when I was trying to be that face. But really, you don't have to look any further than Crews' own New York Times obit for killer tat fodder: "Fight On Deadly Rattlers." What other Crews-worthy ink is out there? What tremendously badass quotes should we all brand ourselves with?